Celebration of the 15th Amendment. In just four short years, the lives of enslaved and already freed African-Americans would change drastically. From being granted freedom in 1865 to citizenship in 1868, the years proceeding the Civil War would be vital not just to the rebuilding of the United States, but the ability of African-Americans to become full citizens. General William T. Sherman issues Special Order No. 15, granting 400,000 acres of coastal land in South Carolina, Georgia, and Florida to newly freed African-Americans. Abraham Lincoln signs the 13th Amendment to the U.S. Constitution. The amendment outlaws enslavement. Congress creates the Freedmen's Bureau. The purpose of the Bureau is to provide healthcare, education and other assistance to newly freed slaves. The Civil War ends on April 9 when Confederate General Robert E. Lee surrenders to Union General Ulysses S. Grant at Appomattox Court House in Virginia. Lincoln is assassinated by John Wilkes Booth in Washington D.C.
African-Americans in Texas receive news that slavery has ended on June 19. This date is celebrated as Juneteenth. Former Confederate states establish Black Codes--laws to disenfranchise African-Americans. Six former members of the Confederacy organize the Ku Klux Klan in Pulaski, Tenn. The organization uses various acts of violence to terrorize African-Americans in the South. Attorney John S. Rock becomes the first African-American to argue a case before the U.S. Supreme Court. Congress approves the 14th Amendment, granting African-Americans citizenship. The amendment also guarantees due process and equal protection under the law to all citizens. Fisk University is established in Nashville, Tennessee, a pioneer among the historically black colleges and universities. Between May 1 and May 3, an estimated forty-six African-Americans are killed, and countless are injured by whites in Memphis. Ninety homes, twelve schools, and four churches are torched in the Memphis Massacre. The creation of four African-American regiments are established in the United States Army and are known as the Buffalo Soldiers. Until the Spanish-American War, African-Americans can only serve in the 9th and 10th Calvary Regiments as well as the 24th and 25th Infantry Regiments. African-Americans residing in Washington D.C. are granted the right to vote after Congress overrides Andrew Johnson's veto. Shortly after, Congress passes the Territorial Suffrage Act, giving African-Americans the right to vote in the West. Morehouse College is founded as Augusta Theological Institute. That same year several other African-American colleges are founded including Howard University, Morgan State College, Talladega College, St. Augustine's College and Johnson C. Smith College. Congress passes the Reconstruction Acts. Through these acts, Congress can divide ten out of eleven former Confederate states into military districts and reorganizing the state governments of the former Confederacy. Visual artist and sculptor Edmonia Lewis creates "Forever Free," depicting an African-American couple as they receive news that enslavement has ended. The 14th Amendment is ratified to the Constitution. The amendment grants citizenship to anyone born or naturalized in the United States. On September 28, the Opelousas Massacre takes place. White Americans in opposition to the Reconstruction and African-American voting kill an estimated 250 African-Americans in Opelousas, La. General Ulysses S. Grant is elected president. John Willis Menard becomes the first African-American elected to Congress. Representing Louisiana's Second Congressional District, Menard is not able to be seated as a result of an election dispute. Howard University Medical School opens, becoming the first in the United States to train African-American doctors. 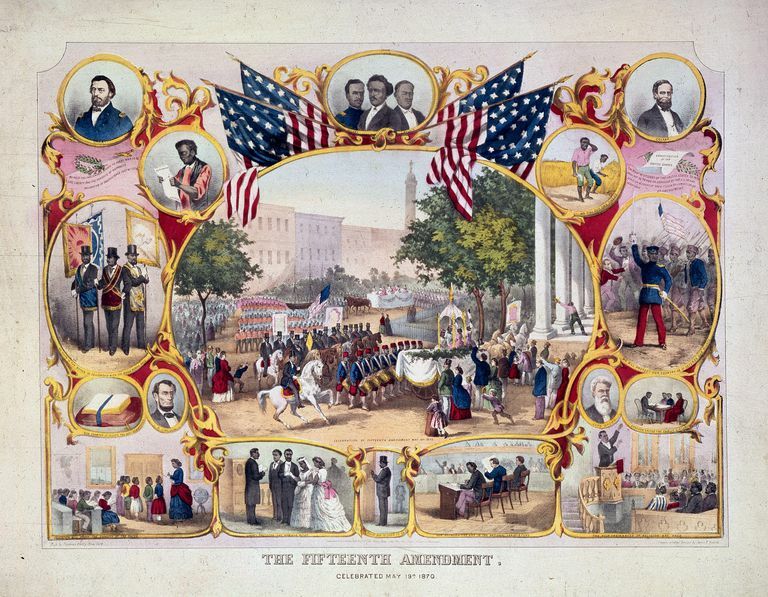 The 15th Amendment, guaranteeing African-American men the right to vote is sent by Congress for states' approval. The amendment will be ratified in 1870. Ebenezer Don Carlos Bassett becomes the first African-American diplomat and presidential appointee when he is made minister to Haiti. The Colored National Labor Union is established by Isaac Myers in Baltimore. George Lewis Ruffin is the first African-American to become the recipient of a law degree after graduating from Harvard Law School.